"The force needed for attitude control and orbital adjustment of a spacecraft, and even transporting a payload in outer space could be achieved using light directly." A team of Chinese physicists has developed a new variety of light-based propulsion system with the ability to harness much greater forces than a conventional solar sail. The key, according to the Nankai University-based group, is in swapping out the mirrored sail—which captures photonic energy as radiation pressure in much the same way a regular air-sail captures wind energy—for a pure-black graphene sponge. Rather than reflect off of the sail, light is absorbed by the sponge, which converts that energy into propulsion. The group's work is published this week in Nature Photonics. Using light and lasers to move stuff around isn't exactly new. Scientists have trapped, moved, levitated, and pulled all manner of micro and nanoscale objects, including graphene, but also cells, viruses, single molecules, and atoms. Really small stuff. In one particular form, the concept is known as optical tweezers, which are IRL, not uncommon scientific instruments. The dream, however, is to scale light-based manipulation up to the world of the macroscopic, which is our (visible) world. "If these optical operations were to be achieved with large objects on a macroscopic spatial scale, significant applications such as the long-sought direct optical manipulation of macroscale objects—including the proposed solar sail and space transportation via laser or beam-powered propulsion—could be realized," the Chinese group, led by civil and environmental engineering professor Yongsheng Chen, writes. Enter our graphene sponge, which offers just that macroscale manipulation. The general idea is this. Graphene can absorb light like few if any other known materials, making it indeed a perfect or close-to-perfect photonic "sponge." The result, referred to as "efficient light-induced ejected electron emission" in the paper, is that the electrons within the material get extra excited or energetic and some of them pop right back out of the material. As the electrons bounce away from the graphene, there is a backwards push against it, just as you'd expect from Newtonian mechanics. Every action has a corresponding reaction and, here, that reaction is motion or a transference of momentum. The sponge moves. Part of the whole problem in engineering something like this is the very basic nature of graphene, which is defined as a two-dimensional lattice of carbon atoms; that is, graphene exists as a perfectly flat, single atom-tall sheet. Stacking sheets of graphene together into "bulk" graphene generally negates many of the material's odd and highly-desirable properties, such as its tremendous mechanical strength—despite being unimaginably thin, the material is bulletproof and many times stronger than steel—and extraordinary electrical and thermal conductivity. Yongsheng Chen and his team discovered the light-based propulsive properties of bulk graphene somewhat by accident. 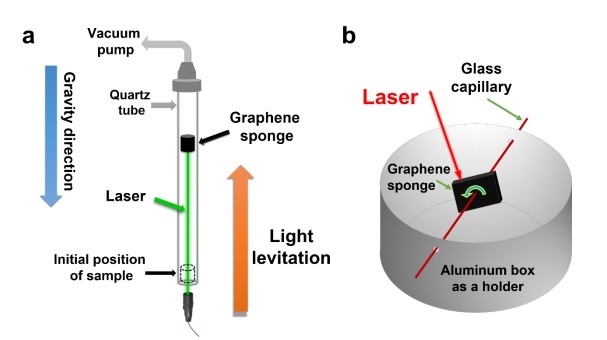 "When cutting the graphene sponge by laser in air," the group writes, "we accidentally observed the laser-induced actuation by naked eyes, which contrasts sharply with the earlier reported microscopic levitation or movement of micro objects due to light pressure. To avoid the likely intervention of air, further systematic studies were carried out in vacuum environment entirely to rule out (minimize) the possibility of heated air disturbance and to avoid the local combustion of graphene sponge due to the presence of oxygen." What followed was a series of experiments using graphene sponges sealed in vertical and horizontal vacuum tubes, where beams of light were applied to the material from either end, causing the material to either levitate or move along the tube laterally. By changing the distance between the light source and the material, the effect could be increased or decreased. The mechanism behind the phenomenon, the ejection of excited electrons, was further verified using x-ray photoelectron spectroscopy to measure the emitted particles. "It is important to emphasize that the remarkable light-induced macroscale propulsion reported herein is a result of the unique electronic band structure at the Dirac point and associated optoelectronic properties of the graphene sheet itself together with the unique macro structural character of this novel bulk graphene material," the group writes. The upshot is that the propulsion system should work with other two-dimensional materials in bulk form, such as silicene, germanium, and certain other thin films. This opens the door to practical macroscopic uses of the phenomenon, according to Chen and co.
"While the propulsion energy/force is still smaller compared with conventional chemical rockets, it is already several orders larger than that from light pressure," the researchers conclude. "The propulsion could be further enhanced by increasing the light intensity and/or improving the illumination area. For example, using an adjustable laser array, the force needed for attitude control and orbital adjustment of a spacecraft, and even transporting a payload in outer space could be achieved using light directly."